The British legal system has something called the “appropriate adult”. This is a volunteer who’s brought in to observe interrogations when a suspect is deemed incapable of looking out for their own interests, either through some learning disability or other mental handicap. 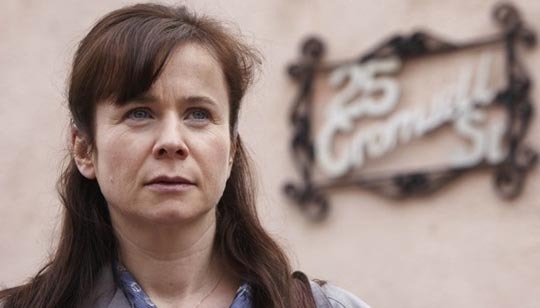 At the beginning of ITV’s two-part fact-based drama, Janet Leach (Emily Watson), a trainee social worker, is called in to assist with an unnamed 52-year-old man. Although she’s taken the training, she’s never actually attended an interrogation before. As she sits to one side of the small interview room, Detective Constable Hazel Savage (Sylvestra Le Touzel) begins the questioning and the suspect launches into a calm, strangely detached account of killing his teenaged daughter Heather, dismembering her body and burying it in his back yard. Director Julian Jarrold plays the scene mostly off Emily Watson’s reactions and we watch as the foundations of everything this ordinary woman believes about the world are stripped away. After the session, the concerned police officer asks if she wants to continue or withdraw, but Janet insists that she’s up to the task. Her decision is obviously partly rooted in her desire not to appear weak; but as the story progresses something else emerges, her shock and disgust mixed with a strange fascination. The man who comes to insist that they are “friends” is Fred West, who was exposed in the mid-’90s as one of Britain’s worst serial killers. He and his wife Rosemary were accused of murdering at least 12 young women, mostly during the ’70s, but there may have been many more. Although the facts of the well-documented case are even more sordid and disturbing than what is depicted here, the script by producer Neil McKay is concerned with something other than a sensational account of a “true crime”. 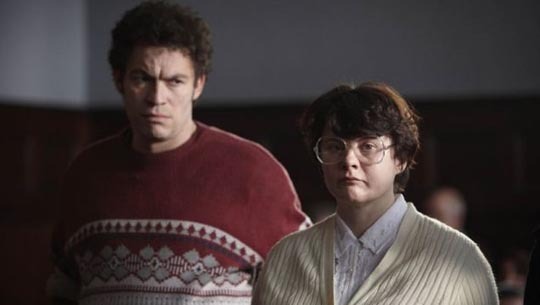 The presence of Janet Leach not only offers a unique point of view into the character of Fred West, but also provides an illustration of how the psychopath manipulates, influences and eventually takes control of an unguarded mind, in the process making it comprehensible how his wife Rose (an absolutely chilling performance by Monica Dolan) could have become an active and willing collaborator in his sadistic crimes. 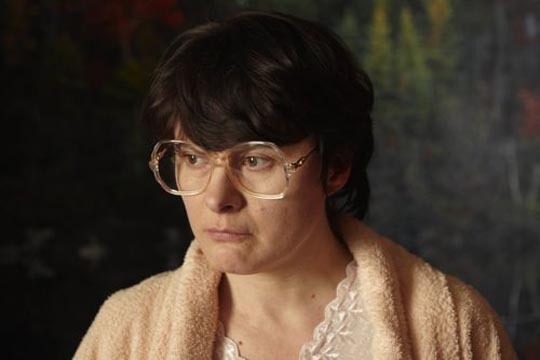 Even after she has been dismissed by the police, Janet continues her relationship with West, confused by her own motives and disrupting her own family life. Their relationship rather than his crimes is the centre of the drama. 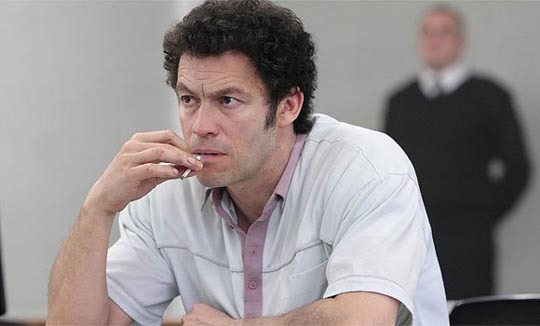 As played by Dominic West, Fred is a mixture of dull stupidity and peculiar charm, and as he slowly draws Janet deeper into the case, confiding little details to her which her professional position forbids her to pass on to the police, we witness his gradual accession of power over her. Her judgement becomes impaired, causing her to make decisions with devastating personal consequences, and losing her sense of herself as he gets deeper inside her head. Director Jarrold keeps things low-key. This is not the kind of fairy tale take on the psychopath that often shows up in movies, in which a romanticized Hannibal Lecter seduces Clarice Starling. Although Fred is often surprisingly disarming, we keep catching tiny shifts in his eyes, the tilt of his head, which reveal just how calculated his expressions of naivety and normal emotion are; this simulation of normality, minutely gauged to appeal to the person he wants to make use of, is a critical component of the psychopathic personality. The film’s strength lies in how effectively it dissects this element and shows why and how Janet falls under his influence. In the end, Appropriate Adult isn’t about the crimes themselves, but about the terrifying power Fred exerts on those who allow themselves to enter his world. With its excellent script and two fascinating performances by the leads, along with a fine supporting cast, this beautifully photographed TV drama offers a frighteningly plausible portrait of a real-life psychopath. Inception Media’s bare-bones DVD presents an excellent transfer. Unfortunately there are no extras to provide background to the case (there are at least two detailed documentaries available on YouTube which reveal just how faithfully the story has been adapted) and, unfortunately given some of the thick accents, there are no English subtitles. This entry was posted in Review and tagged Actors, British Television, Review, True Crime. Bookmark the permalink.